Kimber, LWRC, Rock River, Anschutz, Steyr, Wilson Combat and Browning Direct Dealer with access to ten major distributors for most firearms. Formerly of PA now located in central Tennessee – we are open BY APPOINTMENT ONLY. This site will be closing somewhere around the end of this year. My license expires in Feb. 2020 and I will not renew it. Will start soon listing about another 100 guns for disposal - all high quality, hard to find and/or collectible. Time for us to start to plan for retirement and we will be working to liquidate the inventory. Starting now we have huge retirement reductions scattered throughout our ads. PLUS: We will now consider REASONABLE offers on all listed items on this site. Here is a great opportunity to save on the gun you always wanted and for us to say THANK YOU for all the great years we have had with you. Let us buy or sell on consignment, your collection or individual firearm. As a web based operation we offer worldwide exposure for your items. We are trustworthy and can provide references on request. Feel free to contact us at any time – will be happy to travel for pick-ups on larger collections. Our GunsAmerica sales count is well over 3150 guns with many repeat customers - we would be happy to have you as a customer too!! Email is the best way to contact us right off one of our ads. We must be first come first served to be fair. Email committing to buy with your full name, address and phone # will hold the gun for you if you are the first to commit or just order and pay via credit card right on this site. A confirmation reply will be back to you ASAP with instructions and our full address. Our phone is 931-761-0800 for those wishing to call. Normal layaways are 60 days with 20% (or more if you wish) deposit. All Credit Card transactions will be charged a 3% maintenance fee. Now at the Gunworks - Hogan, Windham, Kimber, LWRC, Rock River, Anschutz, Steyr and Browning Direct Dealer with access to ten major distributors for most firearms. PLUS - We are now Wilson Combat Master Dealers! Perkiomen Gunworks has joined with Rosehill Retrievers to offer the very best in Dog Foods. Do you know what is in your dog's food? 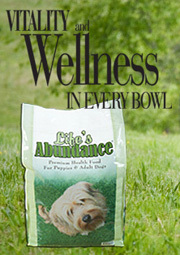 Life's Abundance is a holistic veterinarian formulated food with everything good you want to feed your dog and nothing bad you want them to have.